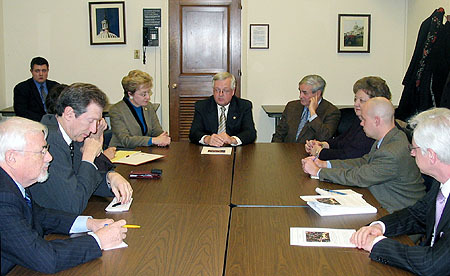 L-R: Ihor Gawdiak, Ukrainian American Coordinating Committee; Marc Levin, National Conference of Soviet Jewry; Congresswoman Marcy Kaptur; Congressman Curt Weldon; JVGC co-chair Ambassador William Green Miller, US-Ukraine President Nadia McConnell; Unidentified House Rules Committee staffer; Michael Bleyzer of Sigma-Bleyzer Foundation. Washington, D.C. (Mar 1)  Meeting yesterday on Capitol Hill with members of the Congressional Ukrainian Caucus, representatives of the Jackson-Vanik Graduation Coalition devised specific steps to urge the House leadership to help pass legislation to release Ukraine from the restrictions of the Jackson-Vanik Amendment. Three Congressional Ukrainian Caucus co-chairs, Congressman Curt Weldon (R-PA), Congresswoman Marcy Kaptur (R-OH), and Congressman Sander Levin (D-MI), were joined by Congressman Lincoln Diaz-Balart (R-FL) and Congressman Jim Gerlach (R-PA) and took the lead in deciding on how to proceed in the coming weeks. Representative Gerlach's bill, H.R. 1053, calls on the House to remove Ukraine from the restrictions of the 1974 Jackson-Vanik Amendment and grant normal trade relations treatment to the products of Ukraine. Currently, the bill is in the Ways and Means Committee and has 44 co-sponsors, but for uncertain reasons has not been moved through committee. All of the congressional members present concurred with Representative Weldon's statement that "the graduation of Ukraine from the Jackson-Vanik Amendment has gone beyond rhetoric" and that its passage is crucial to pass legislation in the House prior to the upcoming March 26 Rada elections in Ukraine. Also present at the February 28 meeting were former Congressman Charles Dougherty and a number of Congressional staffers, representing the offices of Representatives Robert Wexler (D-FL) and Representative Tim Holden (D-PA). Among those representing the Jackson-Vanik Graduation Coalition were Ambassador William Green Miller, co-chair of the Coalition; Nadia McConnell, President of the U.S.-Ukraine Foundation; Mark Levin, Executive Director of NCSJ; Ihor Gawdiak, President of the Ukrainian American Coordinating Council; Michael Bleyzer and Morgan Williams of SigmaBleyzer; and Dr. Zenia Chernyk and Vera Andryczyk of the Ukrainian Federation of America. Both the members of the Caucus and the representatives of the Jackson-Vanik Graduation Coalition expressed their great frustration at the failure of the House to take action on the bill, in particular since the Senate passed such a bill in November 2005. Although there were varied opinions on the tone that should be adopted in removing the anachronistic restrictions, the members of Congress and JVGC representatives agreed that the amendment is irrelevant today, and that Ukraine has met all requirements for its graduation. Michael Bleyzer, President and CEO of SigmaBleyzer, and a Jewish emigrant from Soviet-era Kharkiv, noted that he had benefited from the original Jackson-Vanik Amendment, but he emphatically stated that its imposition wholly inappropriate today and should be lifted. All present agreed on the urgency for passage of the bill before the March 26 parliamentary election in Ukraine and rejected the idea that Ukraine's graduation should be tied to Russia's. If graduation is not achieved before the upcoming Rada election, Ukrainian voters may take this as a sign of failure on the part of the democratic forces in Ukraine. The Jackson-Vanik Graduation Coalition, co-chaired by Ambassador Steven Pifer, and Ambassador William Miller, is comprised of more than 250 businesses and Ukrainian-American, Jewish American, and other non-governmental organizations.